A wallcovering from the Phillip Jeffries Rivets collection clothes the dining room walls, where the palette of nature-inspired colors reflects the rocky coast outside. Sliding glass doors between the breakfast room and an office let light flow through the house. 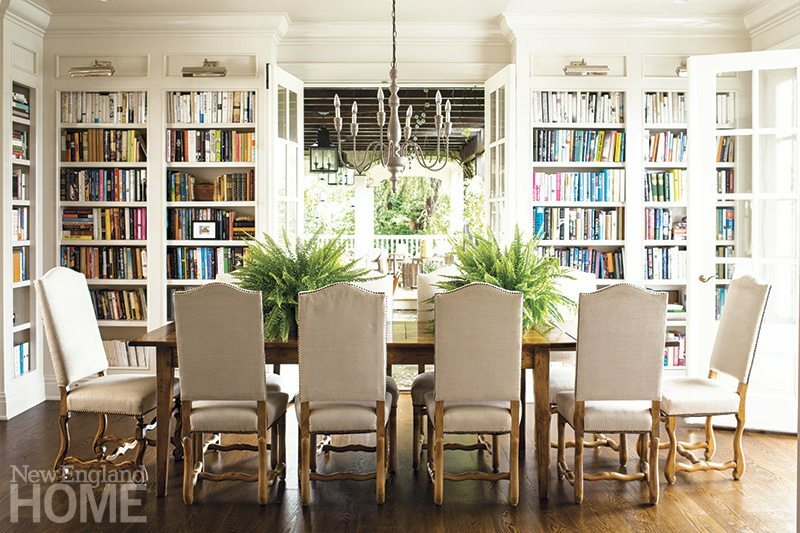 Antique chairs surround a custom table that expands with pie-shaped leaves to seat the homeowners’ extended family. William and Mary-style chairs encircle the table in the dining room, where a collection of Blue Willow china purchased on eBay adds a colorful punch to the antique hutch. An adjustable iron cafe table from Anthropologie cozies up to the banquette. The breakfast area’s chandelier sports a wrought-iron chain that speaks to the barn door’s hardware. A comfortable leather sofa offers an additional spot for relaxing. A galaxy of star lights gives the dining room a celebratory air. "Dinner parties last two hours longer than they used to," says the wife. Open to the kitchen, the breakfast room also connects to a morning room overlooking the ocean. The breakfast room is dressed smartly with Guy Chaddock chairs and a Vaughan chandelier. The dining room area bridges the space between the living room and the kitchen. The dining room wallpaper offers a bit of whimsy for an unexpected touch. Skok paired the antique dining table, a holdover from the Battats’ Needham house, with classic Greek klismos chairs. Hand-blown vases from Sea Wicks in Damariscotta, Maine, take the place of a flowery centerpiece on the dining table. The dining chairs and benches were a local find, too. Texture reigns in the dining room, where grasscloth walls and chairs outfitted in plum-colored wool surround a table that can seat up to twenty. A Moroccan silk shag rug and black-and-silver wallpaper strike a sumptuous tone in the dining room, where a David Weeks chandelier illuminates a round walnut table. Much of the custom woodwork, including the dining table, was crafted by Massachusetts artisan Thomas Sippel. The breakfast area off the kitchen is a study in white and the palest of blues. Cozy and intimate as the breakfast nook is, the banquette can accommodate up to twelve people. Simple draperies let the dining room’s shimmery wallpaper take center stage. An antique column is one of two Stefanon installed to set the breakfast area apart. Mix-and-match Chippendale-style and upholstered chairs in the dining room are one way interior designer John Stefanon keeps spaces fresh. Susie’s favorite shade-orange-adds a zesty note to a sitting nook at one end of the kitchen. In a play on the traditional mirror above the mantel, designer Karen Bow hung three deep-framed mirrors. An iron-based table with a salvaged wood top is a rustic counterpoint to the contemporary rug. A breakfast area off the kitchen makes the first meal of the day special, with upholstered wall details and a massive lantern above a custom table. The delicacy of the antique Charles Winston chandelier and gold-leafed ceiling balance pine walls and cabinetry in the dining room. The breakfast area sports a live-edge table from Dennis Miller and a branch chandelier from Paul Ferrante. A hand-blown glass chandelier by John Pomp lends drama to the dining area. In the adjoining living room, a Matrix coffee table from Cliff Young Ltd. delivers a visual punch. The crystal chandelier, a family heirloom, was the starting point for the dining room. Pale-gray grasscloth makes a modern juxtaposition with the wainscoting. To neutralize the dining room’s flawed walls, the Battles painted it a unifying deep red. They installed a wood stove in the fireplace that was once used for cooking. Although small in scale, the dining table can still comfortably seat six for a dinner party. The sight line from the front door, through the dining room, and out to the sea is breathtaking. Designer Susan Reddick smartly played to the scenery with Lee Jofa linen drapes, a blue Stark carpet, and dining chairs clad in Brunshwig & Fils Oxford blue chenille. Bright navy lacquer on the dining chairs and a blue-and-white Ralph Lauren wallpaper lend a playful look to the dining room. A built-in breakfast seat secures a front-row view to the morning workings of the harbor. A sky-blue ceiling reinforces the dining area’s connection to the outdoors. The kitchen opens to the dining room, where slipcovered chairs soften a streamlined glass-topped table. In a corner of the great room, punches of black and white prove that opposites do, indeed, attract. The minimalist bar cabinet, black lacquered game table, and bold, graphic art fit the homeowners’ request that designer John Stefanon keep things simple, but statement-making. The owner designed the dining room’s chair rail, and builder Artur Domka meticulously crafted it. The fabric on the upholstered chairs and at the windows is by Katie Leede. French doors leading into the living room are a new addition. Adjacent to the kitchen, the breakfast room also sports a limestone floor. Adjustable pulleys mean the lights above the dining table can be pulled up during the day so as not to impede the ocean view. The mural continues onto the dining room walls. Designer Cynthia Deysher left the leaded-glass windows curtain-free. To counterbalance the dining room’s fourteen-foot ceilings and massive limestone fireplace, Deysher chose oversize wing chairs in embroidered silk to anchor the generous dining table and added a William Morris-inspired rug and rock-quartz crystal chandelier. While Estes describes the interior detailing as "simple and straightforward," he added interest with the subtle play of shadow lines. Mirrored Urban Electric sconces, a sparkly Arctic Pear chandelier by Ochre, and a shimmery Phillip Jeffries wallcovering give the dining room as much appeal by day as by night. Perfect for dinner parties, the dining table expands to seat twelve; the antique chairs are a delicate counterpoint to the pedestal table.